I love Mac Mineralized Skin Finish blushes and highlighers, but I have a problem with the price tag and the availability. Is it just me or are most of the Mac MSF’s only available during the collections? I know they have some available in their permanent collection but not a lot. I go crazy tracking down some of the MRS’s before they sell out and then half the time I regret spending so much. I heard a long time ago that the Milani Baked Blushes are dupes for the finish of a Mac MSF blush but I never ran across a Milani display to check them out. Then randomly over the summer, I stopped into a grocery store in a different part of town and this grocery store had a makeup department. I know this may not be a novel thing for most people but I was shocked that a grocery store had a cosmetics isle! My grocery store just has a shampoo isle, but a grocery store than sells OPI and Loreal, something completely new for me. 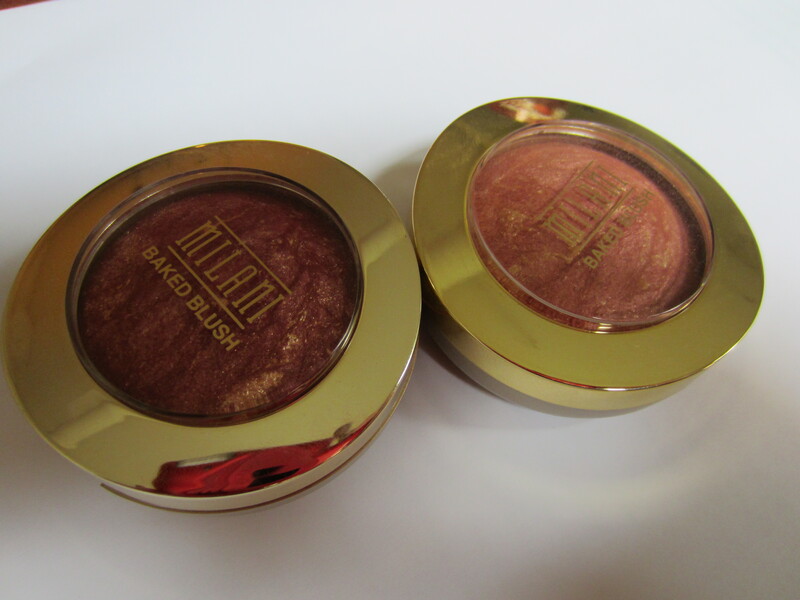 And they also had a Milani section, which had the baked blushes! They retail for $6.99 and are available at CVS and other drug stores, and apparently grocery stores too. There were only 4 colors available at the store I went to but I know there are more than that in the line. I picked up 2 of the colors, the other 2 seemed like blushes I already owned, so I picked up Red Vino (left) and Rose D’Oro (right). As you can see, these have the marbling and veining that the MSF’s have. I love that look! It’s just visually appealing and also makes some of the blushes less intimidating because the lighter vein color will tone down the darker vein color when you mix them with a brush. 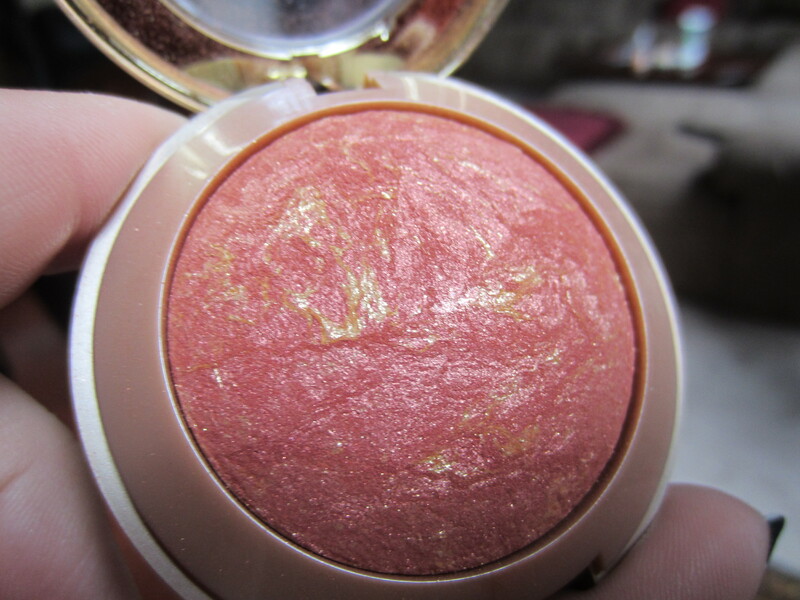 Also, I didn’t photograph this, but the bottom section of the blush opens up and reveals a mirror and a brush. I normally just throw the brush away, or never even open the bottom section. This is Red Vino. The darkest blush in the entire range. I was drawn to this one because it was something that I don’t already own and I thought it would be awesome in the winter. This color is super super pigmented! I need to be really careful when applying this because the first time I tried to wear this I started picking up the product like a regular blush and when I put it on it was a major clown moment. This definitely shows up as a darker red blush, the darkest I own but if I’m careful enough in the application it looks pretty cool. Rose D’Oro is a pinky peach blush and I was immediately drawn to this color. I don’t know why either, its not terribly unique, but its a color you can wear all year round no matter what skin tone you have. This one is also insanely pigmented but since it isn’t as dark it isn’t as scary when you over apply. This color is also more blendable than the Red Vino, or maybe they are the same for blending but the color of this one is easier for it to fade into your skin. Either way, this one has definitely gotten more use than the other blush. Red Vino on the left and Rose D’Oro on the right. Both have that finish of an MSF but are probably a fifth of the price. Plus, there is a little bit of a gold sparkle that you can see in these swatches. That doesn’t transfer to your face as much as you can see it here, so don’t be scared that these seem too glittery. Overall, I like them and they are an amazing find for the price. And since they are so pigmented and I have to use a very light hand, they will last me forever. I don’t think its possible to ever go through one of these blushes. If you have access to Milani, these are a product worth checking out! Laura Geller Baked Cheek Dreams Blush and Highlighter Review! I really enjoy this template you have got going on in your site. What is the name of the design by the way? I was thinking of using this style for the blog I am going to put together for my class project.